The 2018 British Farming Awards finalists have been announced today as part of a record-breaking year for the agricultural event. 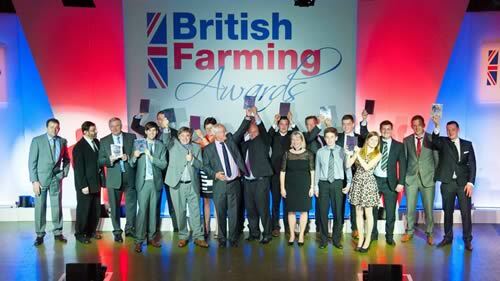 Now in its sixth year, The British Farming Awards recognises the hard work, innovation and determination so prevalent across Britain’s farming industry. Organised by AgriBriefing, parent company of Farmers Guardian, Arable Farming and Dairy Farmer, there are 60 finalists as part of this year’s event, which showcases the diverse achievements and efforts delivered by UK farmers in their day-to-day businesses. There are 15 categories in total, recognising farming’s core sectors, including arable, beef, sheep, dairy and machinery, as well as acknowledging the vast array of farm diversifications emerging as farmers add value to their businesses. A new award for 2018, Farm Worker of the Year, will highlight the vital role and input of employees across the UK, whose efforts can now be recognised. The event also champions the role of agricultural students, new entrants coming into the industry and family farms which are the backbone of so many farm businesses today. Two of the awards will be announced exclusively during the ceremony, which is taking place at the National Conference Centre, Birmingham, on Thursday, October 18. The Outstanding Contribution to British Agriculture recognises an individual who has worked tirelessly for UK farming, either through delivering innovation, championing the needs of fellow farmers, spearheading change and/or promoting the industry to the wider public. The farming industry is, among many things, resilient in times of crisis or adversity. The Farmers Guardian Farming Hero Award recognises an individual, or group of people, who pull together in the hardest of times, striving to make a positive difference to the lives of other people and/or campaigns to raise awareness of issues to the wider industry and beyond. “The British Farming Awards celebrate and showcase the innovation, enthusiasm and drive of individuals who make UK agriculture so special. “We are pleased to be sponsoring the British Farming Awards in 2018 following the success of last year’s event. “We are proud to work with and buy from British farmers. In fact, we work directly with more than 3,000 livestock farmers, over 200 growers and - with the acquisition of Chippendale Foods - we now work directly with 40 egg producers as well. We prefer to deal directly with farmers because we believe this works best for both parties. Matt and Becky van der Borgh, Top Paddock Sheep Dairy, West Sussex.